Polycystic ovary syndrome (commonly known as PCOS) is one of the most common hormonal disorders in women these days. The disorder is affecting an estimated one in every five women in India. The PCOS is not completely curable but one can revert the hormonal imbalance with proper diet and active routine. Celebrity nutritionist Rujuta Diwekar shared the indicators you should look out for if you’re concerned you might have polycystic ovaries. Urging you to “use your natural intelligence and not AI or scales to gauge your health”, Rujuta shared the three most important and “real” indicators, “Energy levels through the day, sleep quality through the night and compliance to exercise plan”. 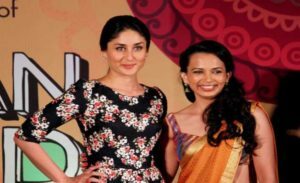 Actress Kareena Kapoor and dietician Rujuta Diwekar. The author, exercise science expert, one of the world’s most-followed nutritionists and a celebrity dietician to A-listers, like Kareena Kapoor Khan, Shahid Kapoor, Varun Dhawan, and Alia Bhatt, also shared that treating PCOS requires a balance of eating the right foods as diet can have a massive impact on PCOS. The best way to get PCOS under control is through lifestyle changes: Sleep, stress management, exercise, and most notably diet. “A diverse diet is key to maintaining diverse gut bacteria which in turn helps with insulin sensitivity and regulates periods.” Rujuta wrote in the post that she shared with her Twitter followers, as well. Coconut, ghee, jaggery and aliv seeds (or halu) that help with enlarged pores on the skin. Raw banana, suran (or yam), and sprouted legumes that prevent PMS, migraine, and spotting that goes on for days. Nachni (or ragi), either as dosa, porridge or bhakri that prevents cramps and acne around the chin. Symptoms of PCOS include ovarian cysts, irregular periods, high levels of male hormones, excess hair growth and acne. But one of the most notable symptoms of PCOS is weight gain, and difficulty losing weight. PCOS and obesity often go hand in hand, thanks to myriad reasons, such as an imbalance of hormones and a likelihood of insulin resistance. To make matters worse, losing weight is hard for women with PCOS and weight gain can make PCOS symptoms worse, trapping people in a vicious cycle. But even though losing weight is notoriously difficult, it’s not impossible. According to Rujuta’s PCOS guideline that focuses on nutrition and not a diet, it may take a few lifestyle changes and some planning, but you can shed those unwanted kilos and finally get your PCOS symptoms under control. “Weight train once a week to improve bone mineral density and muscle tone. Practice yoga asanas, especially the restorative posed like supta baddhakonasana (reclining bound angle pose) to ease pain during heavy flow,” Rujuta wrote.